From the stunning Pacific Rim coastal park to parks offering serenity and seclusion, unique o the province. You be awe-struck by the outstanding beauty of the folded mountains, bountiful wildlife, and dynamic beauty covering wonderful coastlines and islands. Here are 25 Parks you must visit in British Columbia. A 5-hour drive from Victoria, you will arrive to the stunning Pacific Rim coastal park. Enjoy endless sandy beaches, foggy and mysterious rainforest and beautiful trails along the open ocean. Most months of the year, you can spot whales including humpbacks and killer whales! Stroll along famously peaceful Long Beach or trade your water shoes from hiking boots if you brave the 45 km, 2 – 3 day hikes offered in the area. Or, begin at Pachena Bay and brace yourself for a 6 day, challenging hike. If you plan on spending a few days, there are many idyllic camp sites, hotels, or B&Bs at prices suitable for any budget. “Yoho” translated to English means awe and wonder – which is what you’ll be sure to do when you visit Yoho National Park. Yoho is tucked into the western slopes of the Canadian Rocky Mountains where you will explore vertical rock walls, waterfalls and awe-inspiring peaks. Yoho is a park enjoyed all seasons of the year, offering majestic hiking, fossil finding and more. During the winter months, enjoy skiing or snowboarding, snowshoeing or ice climbing. When the sunshine arrives enjoy climbing, hiking, cycling, or fishing. The Yoho National Park is family friendly and suitable for children, too! Kootney National Park is the best spot to enjoy the interesting contrast of nature. Here, you will enjoy icy mountain rivers to steamy hot springs. There are surprises every corner as you explore deep canyons, waterfalls and backcountry hiking trails. One of the best natural hot springs is housed here and is a fantastic destination to relax and rejuvenate. Challenge yourself on the guided hike tours or take a scenic drive through the park. Chill out underneath the stars from the comfort of your tent before cooking dinner on an open fire! Immerse yourself in the expansive and exciting natural Wells Gray park offering over 5,000 kilometres of alpine wilderness, created through volcanoes and complimented by glaciers. It is one of the most unique landscapes in all of BC, where you find yourself re-connecting to nature through hiking, wildlife sighting and taking in waterfalls. What’s your favourite season? During the colder winter months, enjoy backcountry skiing, snowshoeing or snowboarding. When the sun peaks out enjoy the wilderness of ancient forest, paddle the lakes or brave the rapids with a raft! Camping is the best way to enjoy the park, where you can relax along the river’s edge. In the evening enjoy local cuisine and live bands or learn about the First Nations or pioneer history. One of Canada’s 7 Rocky Mountain Park that also is a UNESCO world heritage site since 1984. While famous for its heavy snowfall, this paradise can be enjoyed any season of the year. Get on your hiking books and choose between a leisurely stroll or opt for a more intense hike through the forestry. Here you will enjoy alpine scenery, deep valleys and meadows. One of the best ways to enjoy is by bike! Mountain bike the premises of this exceptional natural beauty before resting for the night in a tent or rent a cabin for a little more luxury. Discover the highest mountain in the Canadian Rockies, Mount Robson which stands at 3,954 feet. There is plenty of exciting wildlife to be spotted here including the Whitetail deer, Grizzly Bear, and Mountain Sheep. Due to the space, these animals roam freely and peacefully. Consider canoeing, caving, climbing, cycling or test your luck fishing! There are wonderful hikes to discover including trails that are friendly for horseback riding. Kick back in the evening with a roaring fire and camping at Berg Lake or Robson Meadows. Joffre Lakes is a splendid option, in close proximity to Vancouver’s infamous Sea to Sky highway! Guest adore the turquoise tinted blue waters of Lower, Middle and Upper Joffre Lakes located along the trails as you explored. The striking colour is due to the glacial silt, offering up beautiful reflections of green and blue. Here you have the opportunity to hike, camp, mountaineer, view wildlife and fish! Camping is permitted in specific areas of the park, but to arrive there is a tricky hike – so you’ll have to earn those late-night s’mores! Named after the 19th century Italian patriot, Giuseppe Garibaldi, this park is known for its beauty and intricate hiking trails. This park is very accessible from Vancouver, only about 70 kilometres from north Vancouver. Those that go will enjoy the rugged mountains landscape, capped by glaciers. There is interesting forestry here, including the Douglas-fir, western red cedar and alpine meadows. One of the best places for hiking as there are many different paths to choose from, varying in difficulty and length. Shannon Falls is the 3rd tallest waterfall offers in British Columbia. Its located on the Sea to Sky highway, not a long drive from downtown Vancouver. Here, guests can enjoy the flowing falls, making the ideal background for a healthy picnic! At the base, one can find the many well-manicured trails for exploring. Those willing, the park also offers fun rock-climbing options, including the local favourite “Local Boys Do Good” or “Klahanie Creek”. Shannon Falls is a great place to visit regardless of the weather because the tree tops will work to keep you sheltered should the rain be out that day. This park is home to some of the more interesting rapids one may ever see! A wonderful Canadian secret. Twice a day the flow of the rapids change, reversing the direction and power of the turbulent rapids. Sometimes, they even exceed 9 feet in height! It’s a specular site, famous for the whirlpools and home for extreme kayakers and divers. The rapids can be enjoyed after a popular 4 km hike, easily accessible for anyone to do. Only 20 minutes from Whistler, and you will arrive to beautiful and unique Nairn Falls. It’s a great starting point for exploring the many trails that connect committed hikers to neighbouring Pemberton or Whistler. Specifically, there is a popular overnight hike that leads to a pretty unbeatable viewpoint at 60m high. This park is rich in history as a very vital park for the Lil’wat Nation. There is also very special wildlife including the rubber boa, a cold tolerant snake! Guests can also enjoy fishing and mountain biking as well as camping with fires. Located in the unique Haida Gwaii, this park is a must do. While a real commitment to get to, you won’t be disappointed. Here you can enjoy 1600 kilometers of dynamic beauty covering wonderful coastlines and islands. You can enjoy the water with a kayak or canoe where you can have your turn discovering the beauty and treasure of this park. There is a temperate rainforest to enjoy with giant trees, ferns and mosses – an eco-system unlike any other. The marine life here is thriving and you wouldn’t be surprised to see pods of orcas, sea lions, river otters or whales! Hiking is abundant as is birdwatching! It’s a very special place where you can reconnect or discover your connection to the earth and nature. Rest your head at unique B&Bs or campsites scattered around the island. This northern BC park offers serenity and seclusion, unique to this area of the province. Visitors will be awe-struck by the outstanding beauty of the folded mountains, bountiful wildlife, and pretty nature like bright flower you will be surprised by! After a 12 kilometre hike, you will be met by jade-coloured water, a highlight to the park. There is so much to explore, you can immerse yourself in the water swimming, scuba diving, fishing or hunting on land. Spend the night under the stars at a campsite fondly called Strawberry Fields! This park is designed for the real adventurous seeking a complete wilderness experience. Located north of Nelson, this park is a lot of fun. This park is very wild so visitors should be prepared upon their trip. Here, hiking is the number one activity to do. There are 85 kilomters of marked trails, for all different levels however the unique quality of this park is the ability to go off the trails and try mountaineering on the glaciers and snowfields. There is lots of scenery to take in, including the beautiful gem-coloured Sapphire Lakes, milky Joker lakes and more. You can enjoy fishing for rainbow and cutthroat trout! Cathedral Park offers stunning natural sites, including jagged mountain peaks, lakes and subtle sweet wildlife. Enjoy intricate rock formations, making for the perfect setting or a day hike. The lakes in the area look unreal with their turquoise granite colouring! Each lake has its own charm that you will quickly love. Cathedral Park offers fishing, camping, hiking and mountaineering to enjoy throughout the year. Easy to access, pretty scenery and peaceful vibes, makes Paul Lake a popular spot. Enjoy the large campgrounds, day use beach with a boat launch and over 7 kilometres for hiking. This lovely lakeside park is within driving distance of bustling Kamloops, should you need to mix in some city time. Guests enjoy canoeing, biking, fishing, swimming and even cross- country skiing in the cold months. Paul Lake is also a popular choice for a water front picnic in nature! This interesting park is one of the largest parks in the province of BC. Tweedsmuir is a quirky place, with triangular shaped mountains for you to enjoy. It’s a magnificent destination for nature lovers. Visitors can enjoy angling, fishing hiking trails, horseback riding, camping or canoeing. There is lots of wildlife that call Tweedsmuir home, including many bears. Visitors who want to brave an evening in the great outdoors can opt for traditional camping or choose Rainbow Cabin which is first come first serve basis and completely free! Nestled in remote Vancouver Island, this park is known as a luxurious forest sanctuary and is easily a favourite for locals in British Columbia. Here, visitors will discover some of the world’s largest spruce trees, ancient gnarled cedar trees and other interesting bio diversity. The park offers unique experiences to hike and explore the different habitats. There are many hiking trails for all levels complimented with dynamic wildlife and interesting trees. Spend hours getting lost in this unique, natural beautiful park. Get ready for a real adventure! Woss Lake is an adventurous paradise…for those with access to a form of boat! You can not get to Woss Lake without one! So, all aboard your boat, canoe or kayak to enjoy this wonderful park. Upon arrival, you will have the opportunity to hike, ski, mountaineer or hike! There is fantastic mountainous terrain, boasting terrific hikes complimented by natural waterfalls and lakes. It’s a pretty under-developed park which adds to excitement! Camping is available to enhance the experience of a real outdoor-sy adventure. Just 3 hours from Vancouver and you will arrive to captivating E.C Manning Park! Its diverse landscape makes it’s a popular destination for outdoor enthusiasts. The climate and geography here make it an ideal all – season reactional paradise. Enjoy canoeing, cycling, fishing, hiking, horseback riding or hunting. When the snow is present, visitors can find interesting snowshoe trails or cross-country trails to enjoy. Known as one of the most beautiful parks in British Columbia, Ts’ilʔos combines rugged mountains, clear blue lakes, glaciers and waterfalls for a natural experience unlike others. The diverse eco system has been well protected over the years, with lots of pretty biodiversity and animals making it home, safely. Visitors can enjoy beautiful lakes of unique and contrasting colors while also gaping at the mountain backdrop. Visitors can enjoy the many hiking trails by foot or by bike or test their luck fishing in the lakes! Snow lingers for almost the whole year at this isolated natural paradise. The best time to test your luck is between July and September 15th, so act fast! To get here, visitors have to arrange their time by foot or float plane, making it extra adventurous and exciting. This park covers 230,000 hectre of Tahltan Highlands in northern BC. This remote area is comprised of volcanic landscape! This wilderness park is a very unique place to visit and offers the ideal backdrop for hiking, fishing, hunting, camping or wildlife viewing. Definitely not for the faint of heart! 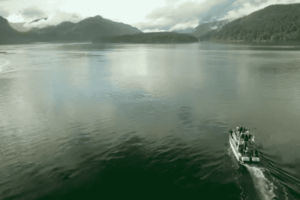 This peaceful region is a slice of heaven in Vancouver Island. Visitors will love the coastal hiking, boating and kayaking. This park is a heritage site, with significant wildlife and biodiversity including interesting trees such as Sitka Spruce, lodge pole pine and more. There are a variety of coastal ecosystems including unique off shore reefs and cobble and sand beach shore lines. It is recommended to enjoy this park by foot and take in all the wonderful and hardy hikes offered – though there are not developed trails – just adventure’s to be had. Snuggled in the Clayoquot Sound, this park is often referred to as a sanctuary. Enjoy the west coast fjord, the perfect setting for a wilderness adventure where vistors can enjoy kayaking, boating, or hiking. This pristine park is home to a large amount of Chinook salmon, which makes this park a popular destination for fishing. Visitors can plenty of activities here, all year and every season. There is also winter camping offered, a brave way to enjoy the nature during the colder months. A newly established park, this natural park was established in 2001. This park is known for its diverse terrain snuggled with small lakes and wetlands. It is home to diverse habitat, including interesting wildlife species and many fish such as kokanee, lake char, rainbow trout, and sockeye salmon. Many people call it a fishing paradise!